The Sunday Times, ‘Style Magazine’ no less, announced in its special ‘Spring Accessories’ magazine that ‘This Season’s Best-Dressed Bags have an Animal Attraction’. Well, here at Zulucow Towers, we’ve known this for a while, Sunday Times! 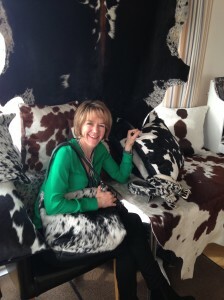 Our classy herd of cowhide bag aficionados have enjoyed our high quality leather; exquisitely patterned cowhide bags, belts and purses ‘Out of Africa’ for a couple of years now! We are also soon to launch a smart new range of cowhide travel bags with our signature natural, sumptuous leather and dramatic cowhide for SS15. Watch this space. Zulucow supported the charity: ‘The Wilderness Foundation’ at their fundraising Spring Lunch Day last week. We gave 10% of all proceeds to the charity which is very close to our African roots; helping disadvantaged youths in South Africa.